There is enough to eat. 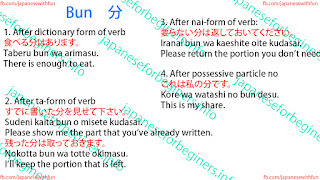 Sudeni kaita bun o misete kudasai. Please show me the part that you’ve already written. Nokotta bun wa totte okimasu. I’ll keep the portion that is left. Iranai bun wa kaeshite oite kudasai. Please return the portion you don’t need. Kore wa watashi no bun desu.